Designed for filtration of common household allergens. Includes 3 bags per pack. 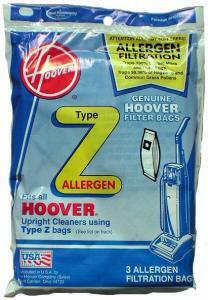 Type Z Allergen Filtration. Fits Hoover® upright cleaners including but not limited to the following: Power Drive, Dimension, Dirt FINDER, AutoDrive, TurboPower 3500, 3700, 4500, 5000, 6000, 7000, PowerMax, Breathe Easy and Caddy Vac.